Two things Lisa and I have learned in our golf travels: (1) our fellow golfing friends possess a well-spring of generosity that never runs dry; and (2) following those friends' exhortations to play a particular course or join them in some erstwhile golfing society has led to many splendid experiences. But when in June, 2014, our friends from St. Andrews, David and Barbara Grounds, first suggested the possibility of our marshaling at the 144th Open Championship at the Old Course in 2015, it seemed a fanciful notion to both of us. Since the topic had been floated near the end of a happy evening of revelry and imbibing, we were not sure it was a serious proposal. But when the Grounds brought the subject up again after we returned to the states, Lisa and I determined that marshaling at the "Home of Golf" could make for a great adventure, and that with our friends' assistance, we could make it happen.. 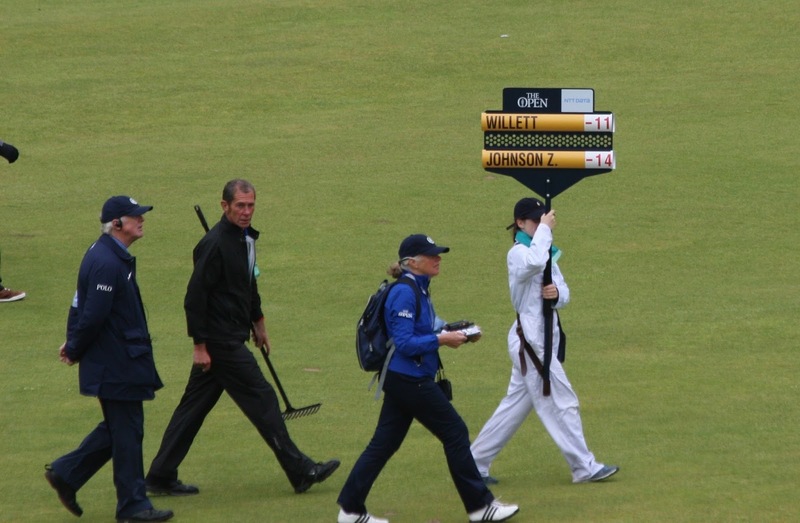 So how does one qualify as a marshal at the Open Championship? David and Barbara filled us in. Because various prominent golf clubs in Fife are assigned marshaling responsibilities for particular holes, we both needed to become members of one of those clubs. For me that meant joining "The New Golf Club." Lisa would apply for membership at St. Regulus- one of the two ladies golf clubs at St. Andrews. Their clubhouses lie hard by the Old Course's 18th fairway- an area which the pros never ever slice into with their drives. David and Richard Perry agreed to sponsor me for membership in The New while Richard's wife (and Barbara Grounds' sister) Chrissie Perry did the same for Lisa at St. Regulus. Joining most clubs in the U.K. does not involve the sort of financial commitment required for membership in an American club. The combined cost of initiation and annual "subscription" fees is roughly equivalent to that which two months of country club dues would entail in the U.S. .In short order, we became proud members of these two esteemed golf clubs. We decided to make it an extended holiday. Since we were joining golf clubs in St. Andrews , we felt we should spend additional time there playing a few competitions and getting to know the members. We also wanted to attend the James Braid Golfing Society's meet in the Scottish Highlands prior to the Championship. The Braid Society has served as our entrée into a host of golfing and social activities. We met our St. Andrews friends at Braid events in earlier years. Those connections led directly to our opportunity to marshal. at the Open Championship. So that Lisa and I could stick together during our marshaling stint, I asked to be included as part of the St. Regulus squad. Mike Brady, Peter Stanbrook, and I would be the only males serving with a team of ladies. Lisa and I met our friendly hole coordinator, Carole Nye, and her deputy, Val Donaldson at the briefing. Carole issued us sharp and official looking blue windbreakers, hats, water bottle, backpack, and marshals' handbook. Unlike the gear issued to volunteers at the U.S. Open, our equipment came free of charge. We learned that St. Regulus would take responsibility for marshaling at the 10th hole (a par 4) and 11th tee box (a par 3) - part of the Old Course's "loop" which turns the players back toward the old town after their outward hike. Carole then e-mailed our schedule for the week. We were slated for half-days, mostly in the afternoons. on the Monday, Tuesday, Wednesday practice rounds, and the Thursday, Saturday, and Sunday championship rounds. The R & A closed the Old Course for play for an extended period prior to the championship. But sightseers and even picnickers were still very much in evidence. We joined them on the Saturday prior to the practice rounds and posed for the obligatory family photo on the Swilcan Bridge. But then to our astonishment, we gazed in the distance and observed two golfers striding down the second fairway with a small gallery. How could this be? The course is closed! A course worker, noting our confusion filled us in. "That's Tom Watson and Brent Snedecker." Apparently if you were competing in the championship, you could play the course. Lisa and I promptly jogged down the fairway to catch up with the pairing. This was certain to be an emotional week for the 5 time Open Champion Watson. Now 65, he would be competing in the Championship for the final time at the Old Course. The R & A would be orchestrating a send-off to rival those enjoyed by Palmer and Nicklaus in their last-gasp competitive efforts at St. Andrews. As championship week would not commence until the following day, there were no gallery ropes restraining us so we and the other onlookers casually mingled with the players as they worked their way through and around the ancient hummocks. Caddying for Tom was his son Michael. Surely this sentimental journey would be a great one for father and son to share. Snedecker had not previously competed in an Open Championship on the Old, and Tom freely offered him advice regarding likely pin positions and the preferred routes into the massive double greens. We were impressed with Tom's unfailing politeness when spectators requested a photograph. Tom even engaged me in a brief conversation. Well, it was actually more of a one-way discourse on his part. After observing me carrying a backpack sporting a St. Andrews University logo, he out of the blue states, "Did you know there were more signers of the Declaration of Independence haling from St. Andrews University than any other institution?" I did not. As I stopped to mull this interesting factoid, Tom briskly moved on. Actually subsequent research indicated that seven signers attended Harvard while only two were alums of St. Andrews. However, I doubt Tom is the sort who would have found it helpful to have been apprised his information was incorrect. I was standing next to caddy Michael when his father mounted the fourth tee. "We are worried about this tee shot. He can't carry the rough on the left to get to the safe area of the fairway," confided Michael. Sure enough, Watson pulled his drive into the heavy grass leading to a bogey. Observing the 25 to 30 yard distance difference in Watson and Snedecker's tee balls, I marveled that Watson had somehow come within an eyelash of winning his sixth Claret Jug only six years before. On the par 3 8th, Tom pulled his shot slightly but still finished pin high on the green. It became very important for him to ascertain whether his ball had carried onto the putting surface or bounced there. This launched a feverish effort on Michael's part to find the faint indentation of a ball mark on the green. This search continued even after the players finished the hole. I even tried to help. Finally, Michael found something he deemed to be the ball mark- I guess it was. When we reached the 11th, a famous par 3 that marks the end of "the loop", Tom stopped for a moment and exclaimed, "This is the hole where Bobby Jones picked up his ball and quit," correctly recalling a historic moment of temper and embarrassment for the future winner of the Grand Slam. Then gesturing to the greenside sand surrounding the 11th, he challenged, "Do any of you know the names of those two bunkers?" When no one responded, he answered his own question. " The Shell and the Strath. You should know that", he scolded. Whereupon he laced a piercing mid-iron shot into a freshening wind which resulted in his ball settling 15 feet from the hole. His knowledge of American history may be imperfect, but make no mistake- Tom knows golf! As the players made their way back toward town, it became evident that word of Watson's unscheduled appearance had spread quickly. An increasing number of enthusiasts taking advantage of an opportunity to be up close with the "Master of Links Golf" had made the scene - and for free to boot! Then as the players arrived at the 15th tee, the validity of the adage that "it never hurts to ask," was underscored when young and strong English amateur Alister Balcombe approached Watson and Snedecker and asked the two stars if he could play in with them. Watson unhesitatingly welcomed the youngster and it was a three-ball the rest of the way. Balcombe had just wormed his way into a life-time memory, the tale of which he may well regale his grandchildren 50 years from now. But when he tells the story, he can be excused if he skips over his nervous tee shot off 15- a dreadful screaming pull which had to be a bit embarrassing. Snedecker offered consolation. "I do that every time I try to impress him [Tom]," he said ruefully. Balcombe then settled down and hit several impressive shots. On 18, Watson graciously posed for photo ops on the ancient bridge. Then he was joined by the other players and caddies. Savoring every moment of the first stage of his "farewell tour" around the Old, I sensed that he was in no hurry to resume play. After several minutes on the bridge, it was Michael who shook his father out of his reverie and told him that it was time to move along. "There will be plenty of time for pictures on Sunday!" Unfortunately, but not unexpectedly, Tom Watson missed the cut and did not make it to what turned out to be a Monday finish. Due to the lengthy weather delays, he finished in the darkness on Saturday night before a much smaller crowd than the R & A had anticipated for the occasion. But for Lisa and me, this Saturday practice round watching the opening act of a great champion's farewell served as its own grand moment. Sunday was special too. Cousin Judge Jim Case and wife Janice had e-mailed us just a few days before inquiring whether we were in St. Andrews by any chance. It turned out that they were coming over briefly to witness the induction of their great friend, three-time major champion David Graham's induction into the World Golf Hall of Fame which was to take place Monday at St. Andrews University. What a wonderful coincidence! They taxied up from Perth on Sunday to visit. We gave them a whirlwind tour of the castle and cathedral ruins followed by lunch at Dunvegan's. Then we headed over to the Old Course so they could check it out. Upon arriving at the second tee, we were informed that Tiger Woods and Jason Dufner, had just teed off on that hole. They had skipped the first hole, perhaps to avoid the attention of the crowd. Yes, Tiger Woods was mired in an unprecedented slump, but we considered it a big deal to catch him in action. He flashed some game, comfortably driving the 9th hole par 4, but then chilly-dipped a simple chip on the 10th. When the four of us reached the Road Hole 17th, we agreed liquid refreshment to be in order, so we set up shop on the outdoor veranda of the Jigger Inn- St. Andrews' favorite watering hole. Downing a Guinness while basking in the afternoon sun with great friends at the Home of Golf- I don't see how it can get much better! After seeing Jim and Janice away after our too-brief visit, we motored over to David and Barbara's house, a little over a mile from the R & A clubhouse. With kindness that cannot be over-estimated, they offered to put us up at their lovely Hepburn Gardens home for the week. That really helped our travel budget because housing in the city during the week of the Open Championship cost a small fortune. Bunking in with us were Peter and Alison Stanbrook from Sussex, England (pictured below). We had met them at a prior Braid Society event, and we were eager to renew their acquaintance. Both the Grounds and the Stanbrooks were also serving during the Open. The Stanbrooks , like us, volunteered as marshals as part of the St. Regulus team. Both David and Barbara Grounds would serve as official scorers. I am sure the six of us would have spent a wonderful time together under any circumstances, but the fact that all of us had duties at the Open Championship would transform our stay into a wonderful bonding experience. Monday, our first day of marshaling, dawned overcast and windy. Conditions never really improved the rest of the week. With some hesitance, we elected to drive to the course from Hepburn Gardens. This meant giving up our off-street parking spot with no guarantee we could find another one close-by upon our return. But if we walked all the way from the Grounds' residence out to our station on the 10th hole- the farthest point of the course from town- that would necessitate a 2 .5 mile walk each way. Considering we were going to be on our feet during the shift, that amount of additional walking struck us as excessive. Upon arriving at the 10th tee, Carole handed out our daily meal tickets and marching orders. I would be stationed in the left rough of the tenth with the primary task of spotting the contestants' tee shots and making sure the spectators did not interfere with the action or move inside the ropes. Lisa would work the tee box. Shortly after making the trek to my position, I saw two male spectators mingling inside the ropes with the players about 100 yards away. Aha! Time for action! I started walking in their direction prepared to restore order. But they both approached me with big smiles on their faces. Then I recognized them: ABC announcers Mike Tirico and Sean McDonough. Media, of course, were permitted inside the ropes. I segued into friendly mode and introduced myself to the broadcasters. They, like many folks we encountered, expressed wonder in how an American landed a marshaling gig. I watched 30 groups or more pass by me, and not one player missed the 10th fairway! It is a good thing that none of them pulled one in my direction because I rarely could pick up the flight of the tee shots. One problem with marshaling the late shift is that we stay on premise until (1) the last player tees off on 11, and (2) "GS 1" (security) releases us from our duties. Generally the players finished their practice rounds by 8 pm, so we were not overly inconvenienced. After returning our armbands back to Carole Monday evening, Lisa and I headed back to the Grounds residence. Notwithstanding their own hard work at the championship, David and Barbara prepared a lovely meal for all of us. Most evenings of the week were spent gathered together at the Grounds' dinner table and parlor as we regaled each other with tales of our daily experiences, some of which were undoubtedly embellished by the fuel of liquid refreshment. The St. Regulus team of marshals rotated the varying duties of marshaling throughout the week. It was comparatively easy and fun working the tee boxes and the fairway. Manning the crossing at the 10th tee in the proper manner was slightly more onerous- as the crowds increased throughout the week so did the level of noise thus necessitating more active crowd control. Way down the pecking order of preferred duties was a shift at the refreshment area which involved controlling the noise of the diners and the often boisterous drinking crowd. You couldn't see any golf, and people in that area always had to be reminded to keep quiet during play. But the hardest assignment by far was manning the grandstand during one of the championship rounds. Seats in the stand bordering the 10th green and 11th tee were among the most coveted on the course. From that vantage point, a fan could watch play on four holes (8 through 11). The stand filled up quickly during our Thursday shift and two long lines of spectators waited with increasing impatience for seats to open up. I worked one entry point with Eileen Marshall. She is the most pleasant of women, but could strike a serious take-charge mien when circumstances warranted. And on this day they did. As the stands filled up, she turned to me and said, "Bill, we are really going to have to be on our mettle today." I cannot recall using the word "mettle" in the past, but I think I will now. In any event, Eileen knew what she was talking about. The big problem was spectators leaving the grandstand to buy a drink or hit the loo and then returning to their seats in the stands. People who had been waiting patiently in line understandably objected. Whether it was an oversight or not, we had not been schooled in our training how to handle this predicament. When someone would say, "my family is up there!" we would let him in. One guy approached the entrance to the stands with four Styrofoam drinks held end-to-end. I did not feel comfortable turning him away. Aware of the increasing disturbance, a representative from the Chief Marshal's office appeared to provide counsel. "Once they leave, they can't come back in without going through the line again." The representative made the point that as many people as possible should have a chance to view the action. Well that caused its own problems. I had advised a couple of fans they could come back after leaving, and I could not very well turn them away. But to let them in brought forth more complaints from those stalled in line. Lisa and her partner on the other side of the grandstand were experiencing identical difficulties. We kept calm and avoided confrontation. Once the likes of Jordan Speith, Jason Day, and Rory Mcilroy passed by, the crowd suddenly diminished and the pressure subsided. Still it was fun. The fact that the day's work provided a challenge gave Lisa and me a feeling of making an important contribution to the operation of the most important golf championship in the world. We were tired by day's end but rallied for a delicious fish dinner thereafter with fellow Braid Society members and marshals, Michel and Claire Joullie from France. Lisa and I had Friday off, and that was a relief because it was the worst weather day of what proved to be a blustery championship. Play was suspended late in Friday's play due to prevailing high winds. Golf balls were being blown off some of the greens- most notably at the par 3 11th- the highest point on the course. We whiled away the afternoon taking a tour of the new distillery at Kingsbarns and checking out various coffee shops in town. One young server bestowed on us an appreciated random act of kindness by comping our piping hot coffee at Janettas Gelateria. We along with the Grounds and Stanbrooks journeyed over to the home of Richard and Chrissie Perry for a delightful dinner party. Lisa and I were forever pinching ourselves that we had made lasting friendships at the home of the game. Our next shift was slated for Saturday afternoon. But play was halted again shortly after it began in the morning as the winds were still unrelenting. When we arrived for our shift at 2 pm, play had not restarted. By now, it was apparent that the championship could not conclude by Sunday as scheduled. Despite the suspension of play, there were still many people milling around our station at "The Loop." Many had traveled a great distance just to witness Saturday's play and it was unfortunate that there was no golf for them to watch. But everyone remained in good humor. The delay gave Lisa and me an opportunity to converse with our fellow volunteers from St. Regulus. It was late in the day before play restarted. With only a couple of hours of daylight remaining, the goal was simply to finish the second round. There were only a handful of golfers who had yet to play through our position at the loop. One was Daniel Brooks, a 28 year old Englishman who stood no chance of making the cut. I was standing behind him on the 11th when he lashed his iron into the still-stiff left-to-right cross-wind. His ball, unlike most shots we observed, managed to hold the chosen line just left of the pin. Upon landing, the ball scooted right, and lo and behold trickled unerringly into the cup-the first hole-in-one in the championship since 2012! If you ever happen to see a replay of Brooks' shot, you will catch me in the background behind the tee. Given that the championship would be spilling over to Monday, Carole inquired of all the marshals as to their availability. We expressed to her our plans to journey down to northern England's beautiful Lake District on Monday morning. Carole nodded her consent indicating that there should be plenty of marshals available and she had "no worries" in excusing us. But as we wearily sauntered back to Hepburn Gardens, (we did not drive to the course after Thursday- the walk wasn't that exhausting after all) Lisa and I confessed to each other sort of an empty feeling. Certainly a part of us wanted to see the championship through alongside the rest of the St. Regulus squad. By the time we reached our lodgings, the Grounds and Stanbrooks already had prepared a fine feast for us. This was followed by parlor putting instruction earnestly provided jointly by Peter and David to hapless me. I don't think any of my putts dented any furniture because I could never seem to get the ball to even graze the targeted table legs. My ineptitude provided plenty of grist for David's droll humor. Upon reporting for duty on the 10th tee on Sunday at 2 pm, we checked with Carole to make sure she could do without us on Monday. To our surprise, she responded that she could definitely make good use of us "if it would not be too much trouble." Lisa and I were in for the duration now, and we both felt that was the way it ought to be. Sunday's play marked the ascendance of unheralded Irish amateur Paul Dunne who set all sorts of records in shooting to the top of the leaderboard along with former Open champion Louis Oosthuizen. Right on the heels of this pair lurked mega-stars Jordan Speith, Zach Johnson, Jason Day, Sergio Garcia, Mark Leishman, Adam Scott, and Justin Rose. Speith's bid to capture the third leg of the Grand Slam was very much alive. At dinner that evening, we learned that Barbara Grounds would be scoring the final round for Zach Johnson. Little did any of us realize what a memorable assignment this would be for our host (see Barbara scoring for Johnson below). For much of Monday's play, I was back again patrolling the left rough on number 10. The tenth was playing downwind and nearly all of the players were taking dead aim at the green 386 yards away. Zach Johnson, not known as a big hitter, went for it also. He caught a great break. His ball landed on a very narrow downslope which helped propel his ball another 75 yards. Zach came by my position and seemed puzzled when he did not located his ball right away. "Where's my ball?" he inquired. "You are on the green sir!" I responded. And so he was. Two putts gave him a much-needed birdie. Zach was in the midst of a tear of six consecutive 3s which ultimately brought him a tie for the championship. That gigantic and fortuitous bounce off the downslope may have made the difference. Once the final group of Oostuizen and Dunne came through, the St. Regulus marshals gathered behind the second green for our assignments on the 72nd hole. We would be manning the rope line to the left of 18 (and right of number 1). We were conscious of our responsibility to be on the lookout for any misconduct, but we still found time to see both Day and Speith barely miss putts on 18 that would have included them in the first place tie. Leishman, Zach Johnson , and Louis Oostuizen were the principals in the 5 hole playoff. When Zach's par on 18 closed out the championship, the crowd's deafening and heartfelt roar reverberated through the "old grey toon." A further great moment awaited us after the presentation. Zach with Claret Jug in hand, circled the arena Cal Ripken style and slapped everyone's hand along the way. That included Lisa and me and the other marshals stationed on the rope line at Granny Clark's Wind. Our final dinner with the Grounds and Stanbrooks marked the end of an unforgettable week, and we all had tales to tell. Barbara was exhilarated over being part of Zach's triumphant final round. She mentioned that he effusively expressed his appreciation for the efforts of the volunteers in his group. 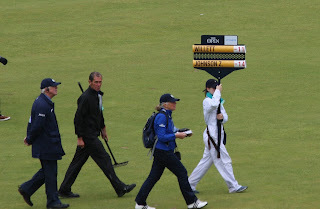 Marshaling at the Open Championship is an experience we will always treasure. The championship itself was memorable of course, but the camaraderie of great friends is what we will cherish the most. (below Lisa drives off 1 with David and friend Umi watching). Then Barbara and David joined us for a round on the New Course. You can tell from David's follow-through (below) that he is proficient at hitting a running draw that works very well in the Scottish winds. We hope to be back soon.